How do I provide structural support for my grape vines? 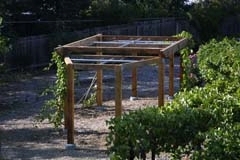 Strong structural support is needed to support the vines and crop; this can be a trellis, an arbor, or a fence. Many gardeners grow grapes on an arbor to provide both shade and fruit.